To the amateur, the world of design can seem daunting and intimidating. There are so many experienced people who use all sorts of jargon and seem to make little sense. At EV Land, our first priority is customer satisfaction – we strive make the communication process as easy and stress-free as possible. We employ a team of a wide variety of specialists, including metal fabricators, stone masons, carpenters, landscapers, and more. We develop landscapes for commercial as well as residential. From the initial design consultation to development of the bid, you'll work directly with the owner. We never begin a landscape development project until you are satisfied with the layout. Why Us to Design Your Yard? We'll Create Your Dream Outdoor Space. Coming Home Never Felt So Good. You might have heard of interior design. When you first think of that phrase, you probably start imagining impressive architecture, neat and cohesive furniture, and fancy décor. Now, try and think of exterior design. This has to do with the outside of a home, and includes much more than just a backyard. Design as we at EV Landscapers know it encompasses everything from pools to landscaping to patios and so much more. Just to give a brief of overview of our design skills and abilities, you should know that we offer a variety of different services. If you have been dealing with water damage, collapsed trees, drainage problems, or any other hurdle, we can fix it. If you’re looking for a new garden area, we can build it. If you need lawn maintenance or more shade in your yard, we’re here for you, whether it’s a new grove of trees that you want planted or a lattice roof structure. 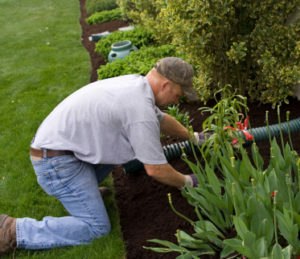 We also offer irrigation services to keep your lawn and gardens beautiful and lush all year round. Whether you’ve been living in your house for the last 20 years or if it’s a newly-built home, we know what just to do and how to treat the landscape. EV Land can handle any challenge! We have created several of our best landscapes in Gold Canyon, Arizona. We believe that a home isn’t truly a home unless you love every inch of it, no matter how unique or mainstream it may be. Give us a call today so we can start planning.